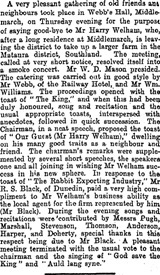 The Bruce Herald, a local paper published in Milton, Otago, between 1865 and 1905, has many references to the activities of Nathan & Jane's children. They are listed as having won prizes for excellence at school and Thomas, William and Samuel were very active rugby players, playing for both the local high school and the Milton Pottery teams. Thomas also excelled in running and cricket. In 1883, William along with 2 friends, was caught by the ranger and fined in the local magistrates court; two shillings plus four and sixpence in costs, for setting a net at the mouth of the river to catch mullet. In 1896 Annie was reported as attending the Milton Quadrille Assembly's Ball, wearing a white dress with gold sleeves. She also won prizes at school. Henry Samuel Welham eldest child of Nathan & Jane was born at Eaglehawk Gully, Bendigo, Victoria in 1857. His parents had met and married there in the goldfields. 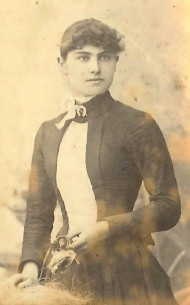 He married Ellen Ashby (b.1863 Kent, England) on 4/05/1885 at Knox Church, Dunedin. 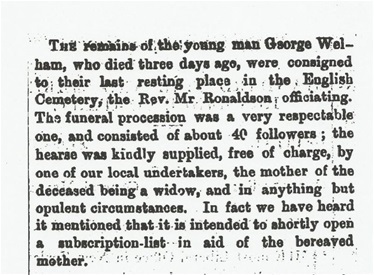 George Welham 2nd child of Nathan & Jane was born at The Pottery, Newcastle, N.S.W on 30/12/1858 and died at Milton, Otago, New Zealand aged 21 years on 16/09/1879. William Welham 4th child of Nathan & Jane, was born at Newcastle, N.S.W. 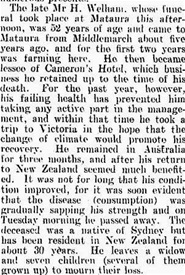 in 1861 and died in Milton, Otago, New Zealand aged 26 years on 11 April 1889 of consumption. Samuel Welham b. 21/10/1871 N.Z. - d. 24/07/1937, London, England. Reported in the Advertiser, Hurstbridge, Friday 30 July, 1937. Married Ada Betts , lived in St Kilda, Melbourne, a grocer, no children. MR SAM WELHAM News of the death last Saturday in London of Mr. Sam. Welham, formerly of Hurstbridge, was received on Monday by Beam wireless. The news will lie a great shock to many Hurstbridge residents. 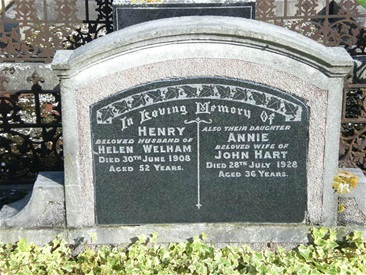 With Mrs. Welham, he was in London for the Coronation Celebrations, and his death occurred in a London hospital. 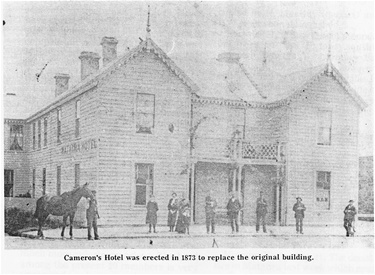 One of the old identities of Hurstbridge, he was one of the leading storekeepers for many years. He was well-known for his many acts of charity, which were always done in a quiet manner. Among his recreations were rabbiting with his fox terriers, and following League football. The sympathy of all will go out to Mrs. Welham, who always worked with him in business, and was his "right-hand man" at all times. The late Mr. Welham leaves no family. Born 3 June, 1873 (Milton, N.Z. ), died 2 July 1929 Opiki, N.Z. ), buried 5 July 1929. Was born in Milton (Candletown) – her parents were Nathan Welham and Jane Davies. She had 6 brothers – Harry (eldest), Will, Tom. Alf, George, and Sam. Sam was the youngest brother and Annie was the youngest child. When she was about 12, her brothers bought her a Singer sewing machine which she loved to use, she loved sewing. She used to sing while she sewed. She had beautiful waving dark hair, every hair curled, and it did not take long to do each morning, just a careless knot and it looked lovely all day. She was a very loving person, with a strong sense of humour. She saw the funny side of most things and was a very lively person to have around, fill of cheerful talk, laughter and songs. She was also a very patient person, and undemanding. In middle age, she quietly endured the problems of a difficult menopause but collapsed in a coma from prolonged bleeding and developed severe diabetes. Without the benefit of modern treatment, the disease caused rapid deterioration, blindness and eventual death at the age of 56. Photo supplied by Amanda Miller.